How long have you been homeschooling, and do you homeschool year-round? Our homeschool journey began when our eldest child started kindergarten. I‘ve been formally homeschooling for the past 7 years. No, we don’t homeschool year-round. What led you to your decision to homeschool? 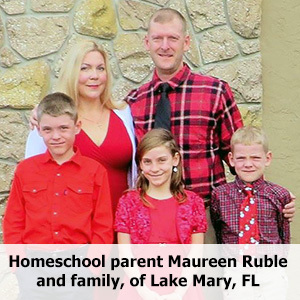 My husband and I made the decision to homeschool so that we could provide our three children with an individualized education that promotes their strengths. We believe that learning can take place effectively in any type of setting, including the home. Our daughter is a competitive gymnast and homeschooling has been a benefit, as she practices 20-30 hours per week. I had been searching for years for a spelling curriculum that worked for my elementary-aged children and could be used for various grade levels. I finally found that program when I discovered VocabularySpellingCity. We initially used the free program but it was working so well that I felt the additional resources available with the Premium membership would be even more beneficial. Since you were a free member and now are a Premium member, with all the benefits, what can you tell us about the difference? While the free membership was working for us, the Premium membership is vastly superior. It is easier to make lesson plans, offers more games and activities, additional lists, feedback that I can offer to my students via the computer and reporting tools. It is well worth it to purchase these additional features, especially if you plan to use VocabularySpellingCity as the primary spelling curriculum. How do you use VocabularySpellingCity to homeschool your children? VocabularySpellingCity is the basis for our homeschool curriculum. I incorporate written work and a weekly written spelling test along with the online program. For example, on Sunday I will create a spelling list online with either words available to import, or my own list. On Monday, each child receives flashcards with their spelling words for the week. They have a spelling notebook and will proceed to write each of the words three times (they will do this daily during the week). I also have them write two sentences using their spelling words. Then, they will complete three activities on VocabularySpellingCity that I have assigned to them. On Friday, they complete the online spelling tests and then a written test as well. Do you follow a curriculum, create your own, or a mix? I use a mixture of following a curriculum while adding in our own components. I primarily use the ready-made lists available within the online program. However, if I notice a trend of misspelled words during our writing class, I will make note and that will become the next list for the following week. Do you use VocabularySpellingCity for word practice beyond spelling? Yes, we use it for vocabulary and writing as well. We use a laptop computer for this program. What do your kids say about learning with VocabularySpellingCity? What do they like, or get the most out of? Do they find it easy to use? All three of my children rave about VocabularySpellingCity. This is the first school year that they have not complained about spelling being “boring.” They are actually excited about their spelling time each day and look forward to receiving their new lists. Progress in spelling has improved immeasurably for all of them as well. Most weeks, they ace their spelling tests. This not only boosts their confidence but gets them interested in learning new vocabulary words. Do you participate in a homeschool group or co-op? How does your family participate in the group to share resources? Yes, we belong to a large, formal homeschool co-op. We often discuss resources that are working for our families with one another. What are your future schooling plans? Will you continue to homeschool through high school? We plan to homeschool throughout middle and high school. In middle school, they will participate in formal homeschool technology classes at Full Sail University. In addition to our participation in the co-op, they will also enroll in advanced placement and dual enrollment at an area state college during the mid/late high school years.